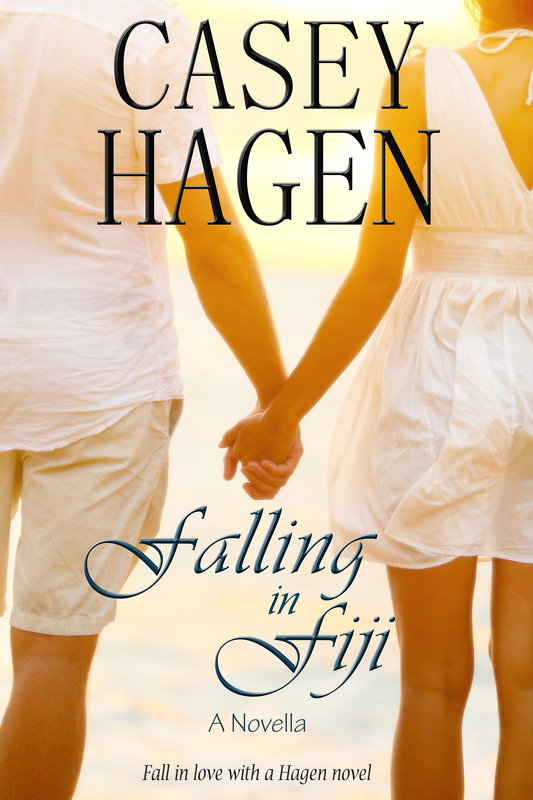 I’m back everyone…here’s a snippet from my novella Falling In Fiji! He stepped right up into her space. His body lined up meeting hers and she forgot to breath. “I think you’re pretty great,” he said. She looked up into those deep blue eyes. Something about those eyes seemed to see inside her. She stood frozen eyes locked on his. “I think you’re pretty great too,” she whispered. Her eyes dropped to his mouth. A shiver of awareness stole her breath. Sensations assaulted her at the feel of his big hand threading through her hair. Her eyes drifted shut as her breath stuttered in her lungs. Tilting her face up he crushed his lips to hers. He kissed with confidence, giving and taking with every brush of his lips masterful lips on hers. Feeling the slow glide of his warm tongue brushing her bottom lip she opened for him. With a low growl, he cupped her backside pulling her up on her toes. The hard length of him lined up with her center creating a desperate need to press tighter to him and relieve the burning ache between her thighs. The slow slide of his tongue against hers ignited her. Aroused and desperate, a needy whimper escaped her. Burying her hands in his soft hair at the nape of his neck she sought more. More of his heat. More of his taste. She couldn’t help herself she bit his plump bottom lip and reveled in victory when he growled low in his throat. …next week I think I’m going to bring you some new snippets. Maybe from Sunset at Lake Crane which is with my editor right at this very moment or maybe from my work in progress, Nightfall at Hunter’s Ridge. Any preferences or should I just keep them coming? 7 Responses to "Snippet Sunday June 28, 2015"
Very sensuous and I love the descriptions in this. Thank you! I still have to go through this novella and then let my editor pick it apart until I bleed, but I loved, loved, loved writing Everett and Corrine! A nice moment in time for them, and as P. T. said, very sensuous. Great snippet! A lot of sensual detail here… and the best part? How they think that each other is “pretty neat”. It’s so cute and set such a sense of mood. Very effective… the prose really flows well. So sorry for the delayed response to this week’s post. I’m playing catch up on Sunday Snippets. Loved the way you described this scene and their heated feelings. The beginning was cute and led perfectly to it. Great snippet.